How to survive a zombie infection – and other minor disasters » Triple E.D. Today I, Markus, had the pleasure of listening to Herman Geijer. The expert on how to survive a zombie infection. 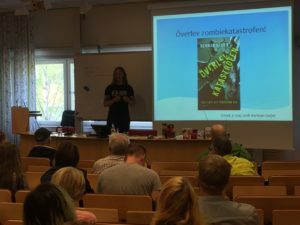 Herman has written two books about the phenomena and now is giving talks all over Sweden about how to best prepare. It was a pleasure to listen to him, giving examples that are highly relevant to our behaviors and contemporary examples of disasters, such as 9-11, Hurricane Sandy, Forest fires in Sweden and bridges that breaks and people keep driving off from. I should nuance this slightly, Herman is indeed talking about zombies, but as a metaphor for understanding society´s preparedness level for more common disasters. From a extreme context point of view, it is yet an example of what we can learn when we apply such a empirical lens! Btw, the photo do not show it, but the room was packed! This entry was posted in Extreme contexts, Zombies and tagged disasters. Bookmark the permalink.